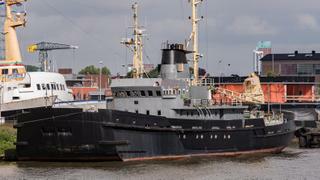 Melbourne-based studio Sabdes Yacht Design has opened up about its plans to convert the icebreaking tug ship Anschutz (ex-Max Waldeck) into a 50.88 metre explorer yacht. Launched in Hamburg in 1966 by Norderwerft, she is notable for being the first icebreaker with the Thyssen-Waas bow design, which crushes sea ice below the hull instead of parting it. Tests off the coast of Finland have shown that this design is 60% more efficient than a traditional icebreaker, although the bow can be removed if a more traditional aesthetic is preferred. Anschutz was decommissioned in 2006, but designer Scott Blee sees great potential for her to be transformed into a highly capable globe-trotting yacht over a period of 12 months, working with brokerage firm Van der Kamp Shipsales. The build yard is undisclosed at this stage. As the initial profile above shows, she would feature a large superyacht helipad on the aft deck with the rescue boat cleverly integrated into the superstructure. Other key features include an extended bathing platform added onto the transom; however her rugged charm would be retained, with a reverse-angled windows on the superyacht wheelhouse and dark faired topsides. Anschutz could accommodate at least 12 guests and ten crewmembers, with the option to expand to more cabins if required. All vital systems, including the engine installation and freshwater intercooler, are still in an excellent condition, so would not need replacing. Blee adds that her top speed of 13 knots and cruising speed of 10 knots should be unaffected by the extra weight of a luxurious and high-tech interior. 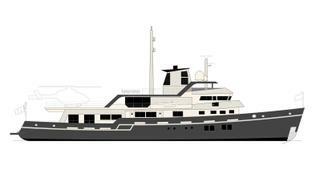 Other superyachts currently under development at Sabes Yacht Design include the 39 metre Project SLeek, which was developed in collaboration with Dutch yard Feadship.